On Saturday, August 11, 2012, I attended the "Texas History Education Summit" at the Bob Bullock Texas State History Museum in Austin. Although I would not take the oath of office from Governor Perry until August 22, I was invited as presumptive state historian. The need for a Texas History Education Summit had been discussed for nearly three years. With the help of several key individuals, the Texas State Historical Association took the lead in organizing the summit. There could be no more suitable site than the Bob Bullock Museum, and this state-of-the-art museum cooperated fully in the providing facilities. I did not know that some of these organizations existed, and I met many people I need to know. Each of us was allowed a brief statement, and listening to the variety of interests - many expressed with deep passion - was a vivid reminder of the enormous diversity of subject areas of Texas history. Informative handouts were presented to each of us. Following the opening statements, a panel of accomplished and award-winning teachers described the problems they face - and the successes they enjoy - in teaching fourth- and seventh-graders. There was a working lunch, sponsored by the TSHA and the Texas Council for History Education. Later we divided into two groups to discuss ways of improving existing efforts or establishing new efforts. It was an enormously informative day for me. Steve Cure, Director of Educational Services for the TSHA, chaired the event and was greatly pleased that a major step had been taken in coordinating efforts to benefit the teaching of Texas history, and future summits will be planned. I attended another event while I was the presumptive state historian. The annual meeting of the Wild West History Association was held in Prescott, Arizona. I spent time with Marshall Trimble, who has served as the State Historian of Arizona for 14 years. A history instructor at Scottsdale Community College, Marshall is a popular speaker and author. Marshall shared advice with me regarding the duties of a state historian. I presented the leadoff program about "Gunfights of the Arizona Rangers." The Ranger company operated from 1901-1909, with the assignment of curtailing criminal activities such as stock rustling, train robberies, and street shootouts, so that the U.S. Congress would grant statehood to violence-riddled Arizona Territory. I've written two books on the Arizona Rangers. Arizona's Rangers were modeled on the Texas Rangers, and Texans gravitated to the action. The Arizona company was limited to 26 men, and from 1901-1909 107 men wore the Ranger badge. Forty-four of these lawmen - or 41% of the total - were from Texas. Several had been Texas Rangers; Sgt. Billy Old of the Texas Rangers, for example, became Lieutenant Old of the Arizona Rangers. The Arizona Rangers of 1901-1909 provided the last sustained gunfighting experience of the West, and Texans were prominent in this dangerous adventure. At the WWHA awards luncheon, I was privileged to receive the Lifetime Achievement Award and the Six-Shooter Award for the best article of the year. A year earlier I was approached by Greg Lalire of Wild West Magazine, who asked if I could make a case that Texas was the gunfighter capital of the old West. I embraced the project, and "Texas: Gunfighter Capital of the West" was published in the October 2011 issue. My first book, Encyclopedia of Western Gunfighters (University of Oklahoma Press, 1979) included a study of 255 gunfighters and 589 shootouts. There were more gunfights in Texas than in any other frontier state or territory. More gunfighters were Texans; in a rating of shootists, 10 of the top 15 were Texans. There were more blood feuds in Texas, and western violence between cattlemen and sheepherders began in Texas. Nothing is more dramatic than life and death conflict, and when that conflict occurs in a frontier setting a special appeal is generated. Texas experienced more frontier violence than any other state. When Texas began to settle down early in the 20th century, it is hardly surprising that with the action shifting westward, the largest number of Arizona Rangers were Texans. A few months ago I was contacted by Larry McNeill, an Austin attorney and a past president of the Texas State Historical Association. A major goal of Larry's TSHA presidency was the creation of the position of State Historian of Texas. After all, there is a state climatologist, a state photographer, a poet laureate -- certainly there should be a state historian. In 2005 Larry succeeded in having a statute adopted which established the position. Dr. Frank de la Teja of Texas State University in San Marcos was selected as the first State Historian of Texas. He was succeeded by Dr. Light Cummins of Austin College in Sherman. Both professors are distinguished historians who established a high standard for the office. Larry McNeill served as chairman of the selection committee, and when he contacted me about being a nominee, I expressed serious reservations that my qualifications were far short of those of the first two state historians. Larry told me that I was recommended by a longtime friend, Dr. JoAnne Stiles, retired professor of history at Lamar University and a member of the selection committee. During a two-hour interview at my home, Larry calmed some of my doubts, and I began the application process. Early in this process I visited Dr. Gregory Powell, president of Panola College. A year earlier I had ended a lengthy career as a faculty member at Panola, but Dr. Powell enthusiastically insisted that I accept an office and an institutional affiliation with the college, should I be selected. Since the position of state historian was established when the State of Texas was undergoing financial cutbacks, the office is unfunded, even though a great deal of travel is expected. Dr. Powell therefore offered travel funding from the Murphy-Payne Foundation, generously established by Foster and Mary Payne Murphy to finance a lecture series and other historical activities at Panola College. In July I was surprised -- and immensely honored -- to learn that my application had been accepted. There are approximately 3,000 state appointees to boards and miscellaneous other positions. Many of these appointees sign the oath of office in front of a notary public, then mail the papers to the Texas Secretary of State. 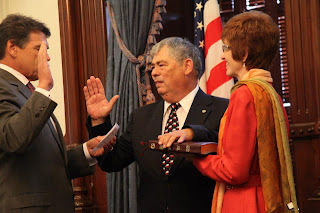 But the statute creating the State Historian of Texas required that each appointee should take the oath at the governor's office, hopefully with the governor present. Through the assistance of the Governor's Appointments Office, a date and time were arranged when Governor Perry could administer the oath. At 11:30 on Wednesday morning, August 22, a large gathering of family and friends entered the Governor's Public Reception Room adjacent to his office on the second floor of the State Capitol. In addition to my family members, my lifelong mentor and friend, Dr. Joe Parks, was there. Dr. Greg Powell came from Carthage. 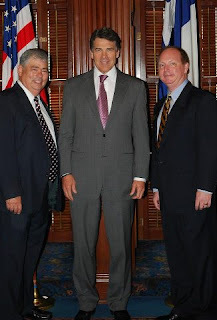 Fittingly, Larry McNeill was present, and so was Kent Calder, Executive Director of the Texas State Historical Association, Steve Cure, Director of Educational Services of the TSHA, and Mark Wolfe, Executive Director of the Texas Historical Commission. 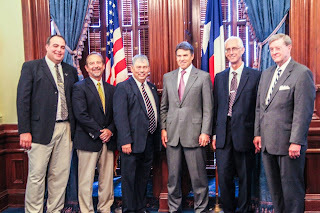 We were told that Governor Perry could only be with us for a few minutes, but we enjoyed his company for well over half an hour. He spoke engagingly with everyone there, including my small grandchildren, and he called us each by name throughout the event. My wife Karon is a graduate of Texas A&M, and Governor Perry talked with her about their alma mater. I presented him with inscribed copies of two of my books which involved him or his interests, and he dispatched an aide to bring me a copy of letters from a World War II Aggie officer who was killed only days before the surrender of Germany. Governor Perry showed us a Bible used for these ceremonies, and indicated to us the signatures of many notables who had used this book. Karon held the Bible and I placed my left hand on it, while Governor Perry administered the oath of office. Then he signed the oath document, and so did I. He presented me the pen, and at his invitation I also signed the Bible. Governor Perry genially posed for photos with each group present before finally departing for his office. As we were ushered out of the reception room, my family and friends talked excitedly about what a warm occasion it had been. So now I have a dream job: State Historian of Texas. Texas has the richest and most colorful history of any state in the Union. I fell in love with Texas history as a boy. As an adult I've been privileged to teach Texas history on the college level for decades. Half of the books I've written have been on a variety of Texas history subjects. I've presented programs on Texas history to groups all over the state. For the next two years it will be a deep privilege -- and an even greater pleasure -- to serve as statewide ambassador of Texas history.